Brads - Brass Shade. Head Size - 1.8cm. Package includes - 3 Pcs of Brads. Ideal for Crafts, Mixed Media, School and Scrap-booking Projects. 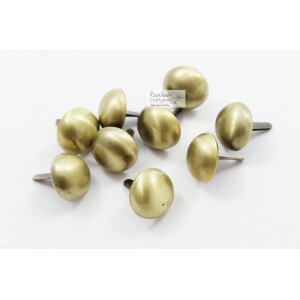 These paper fasteners have have brass and bronze finish. The legs of the fastener are flexible and strong to secure your arts or crafts projects. High Quality Metal Charm - Bronze Small Bows - 4/Pkg ..